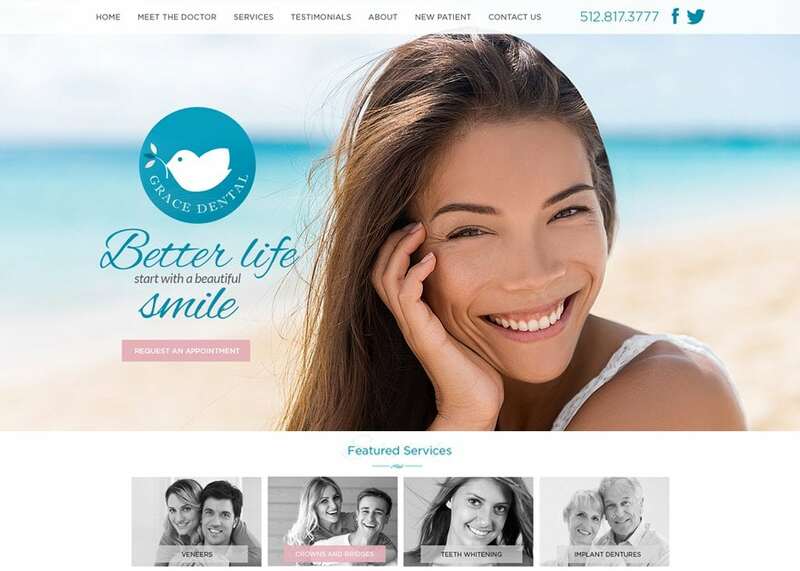 Throughout the previous year, Optimized360 has developed and launched hundreds of beautiful, custom dental websites. As 2018 sets in, we thought we’d look back at a few of the standout designs of 2017, and what makes them unique. This website is set against a background of green, turquoise, and black. Together, these colors contrast with bold geometric patterns to create a stand-out design. The colors are cheerful and modern, giving the impression that Massih Orthodontics is a progressive practice that is setting new standards for care. For this website, we eliminated the traditional navigational menu bar, instead opting for a single visual tile-based menu that absorbs most of the home page. From there, visitors are directed to various areas of the website, including an area about the office and the services it offers. For the convenience of patients, we also included the option to download new patient forms so as to minimize appointment-day paperwork and wait times. For this unique design, we operated on a full-width layout rather than a traditional site with marginal white space on the sides. The home page navigational menu spans the upper portions of the page, navigating to additional information about the practice, the doctors, and their services. Further into the home page, visitors have the opportunity to meet Dr. Hadaegh himself and go on a tour of the office. Finally, we rounded out the home page with direct links to special services, as well as some positive reviews left by real patients. For this unique design, we operated on a full-width layout rather than a traditional site with marginal white space on the sides. The home page navigational menu spans the upper portions of the page, navigating to additional information about the practice, the doctors, and their services. Further, into the home page, visitors have the opportunity to meet Dr. Hadaegh himself and go on a tour of the office. Finally, we rounded out the home page with direct links to special services, as well as some positive reviews left by real patients. Dr. Mimi envisioned a clean and organized dental website. The light colors are friendly and inviting to visitors of their website. Bright imagery with a soft palette represents the spa-like atmosphere Westlake Smile Studio recreate in their office. The featured services are visible on every page for easy access. This clean and appealing website takes no time in engaging the visitor, prospective patient. Contact information is clearly presented on the front page as is an appointment scheduling form. Dr. Michael McCoy dental website was designed to be clean and inviting for visitors. He wanted to have plenty of white space allowing his information to be read clearly. A clear and visible navigation at the top of site gives a user easy access to important information. This is a traditionally built website with some progressive design elements. For example, the navigational menu is somewhat discreet, hidden in the corner as an expandable ‘small menu’. The site also features scrolling images and responsive links to outside reviews on the practice’s social media accounts. The pictures show the faces of the entire office staff at each location – not just the dentists. 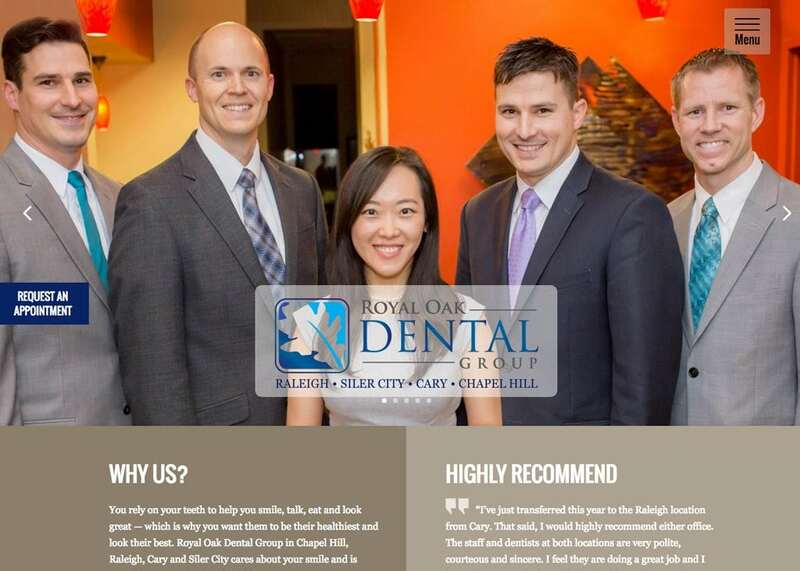 This gives the impression that Royal Oak Dental Group operates like one big family. Visitors may find this refreshing and unpretentious. They may also feel more comfortable getting to know the people depicted in the images before their first appointments. This website was customized for Dentistry 4 Kidz with a customized animated header. This website is mobile accessible and has on-site SEO. We have created an advanced slideshow of their office. This design is a direct reflection of the office they have established. The happiness the website brings is the same happiness their patients feel about their dental office. There is a contact form for easy contact to the office. In addition, there is a before and after gallery and specialized videos. When you first arrive at the Anita Myers DDS general dentistry website you are greeted with the charming happy smiles of singles, children, couples, and families. Each of them radiates a confidence in their smile that is intended to demonstrate the happiness and self-assurance that a rejuvenated smile can provide to their patients. Everything about the landing page is warm, welcoming, and subtly inspiring. Bright colors, endless smiles, and a presentation of services in a font that is reminiscent of children’s books show the focus of this site. The animated characters found on the home page help to ease a child’s anxiety about visiting a dentist, while the information is presented in a way that allows the parent to research the child’s visit without imagery that will set the little patient ill at ease. It’s a perfect approach for a child-focused business, especially a service that may otherwise frighten younger patients.